One of the treatments that can be provided by our chiropractors at Worcester Chiropractic Clinic is acupuncture, otherwise known as dry-needling. On this page we explain why it is useful, what acupuncture can help with, how safe it is and how acupuncture works. 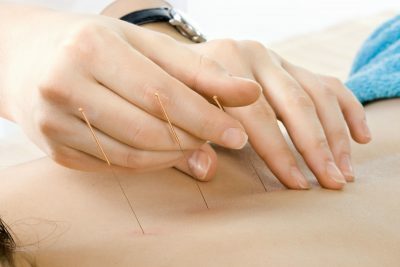 There is no additional charge for acupuncture services at Worcester Chiropractic Clinic, and it is used in conjunction with other manual therapy techniques for best effect. If you think that you would benefit from acupuncture or manual therapy, please get in contact. We are going to use the terms acupuncture and dry-needling interchangeably, however, there are differences between acupuncture and dry-needling. 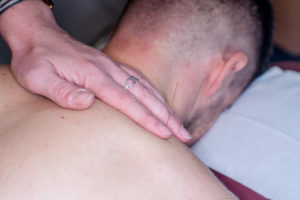 These differences are mostly to do with the origins of each technique, but both systems involve the placement of very fine needles in to muscles for therapeutic effect. This article does not cover acupuncture as used in Traditional Chinese Medicine and so we will use the terms acupuncture and dry-needling interchangeably. Dry-needling, sometimes also known as Western or medical acupuncture, originates from the 1930s to 1950s. When Botox injections were first being trialled as a means of treating muscle spasm, placebo controlled studies were conducted where no Botox was injected but a needle was still inserted into the muscle. This “dry needle” was just as effective at switching off muscle spasm, as long as the needle was inserted into a specific point within the muscle. This led to the widespread use of “dry-needling” in the treatment of muscle pain and as an adjunct to manual therapy. As a standalone treatment, acupuncture is very helpful in relieving muscle tension and easing knots or tight muscles. But where it really comes into its own is as an adjunct to manual therapy. Acupuncture is frequently used by our chiropractors to assist with the treatment of nerve, muscle and joint problems. Switching off muscles that are tight or in spasm makes other treatment easier to carry out and is often more comfortable for patients. While there are many ways of doing this, acupuncture can be preferable to some people for a number of reasons. It is often less painful than other stretching or soft-tissue therapy methods used to relax muscles, and doesn’t require movement or being put into any strained positions, which can be immensely beneficial if you are in severe pain. As a way of relieving tight or tense muscles, acupuncture can be helpful in the management of quite a number of musculoskeletal problems. Dry-needling on its own has been found to be helpful for headaches and migraines, lower back pain and neck pain. However, alongside manual therapy it has a greater range of uses. When carried out by trained professionals, acupuncture is one of the safest treatments available for musculoskeletal conditions. Our chiropractors have conducted in-depth post-graduate training in acupuncture and are insured and regulated as providers. We do not offer acupuncture to patients with blood clotting disorders or who are on anti-clotting medication as a precaution. A small minority of people experience minor bruising or bleeding around the site of the needle. Occasionally, there can be pain as the needle is inserted. This is more common in very contracted muscles and those with lots of fibrous tissue (eg. calf muscle). There are a number of different mechanisms of action that explain why acupuncture has a therapeutic effect. First, and most simply, is the production of beta-endorphins following insertion of a needle. Beta-endorphins are chemicals naturally occurring chemicals in your body that strongly resemble opiates (similar to those found in morphine and codeine). They are produced in response to noxious stimuli and are one of your body’s in-house pain killers. Beta-endorphins are also produced during exercise and are the reason athletes report a “high” following exercise. Inserting a needle tricks your body into assuming damage may be about to occur, and this triggers the release of these natural pain-killers. 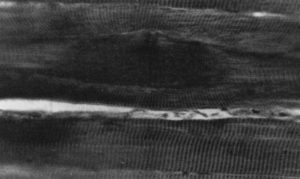 Ultrasound scan of muscle fibres. The dark patch indicates a bunched up muscle fibre, or trigger point. The other main way in which dry-needling works is to do with the switching off of contracted muscle fibres. A common source of muscle pain is something known as a trigger point. Trigger points are bunched up muscle fibres that are having trouble relaxing. When a muscle, or a muscle fibre, tenses for a long period of time it is painful and can refer pain to other areas of your body. There are nerve endings within your muscles which, when stimulated (for example by direct pressure), force the muscle to relax. While direct pressure on a trigger point can be painful, an acupuncture needle has the same relaxing effect without the same level of discomfort. Acupuncture, or dry-needling, works by causing your body to release natural pain killers and by causing tight muscles to relax. Relaxing tense muscles is helpful in many situations, either directly improving your pain or making manual therapy more comfortable. Needling is very safe, however needs to be carried out by trained practitioners to avoid risk of injury and to ensure effectiveness. If you feel that you would benefit from dry-needling, or you have an injury that you would like us to take a look at, please get in touch.